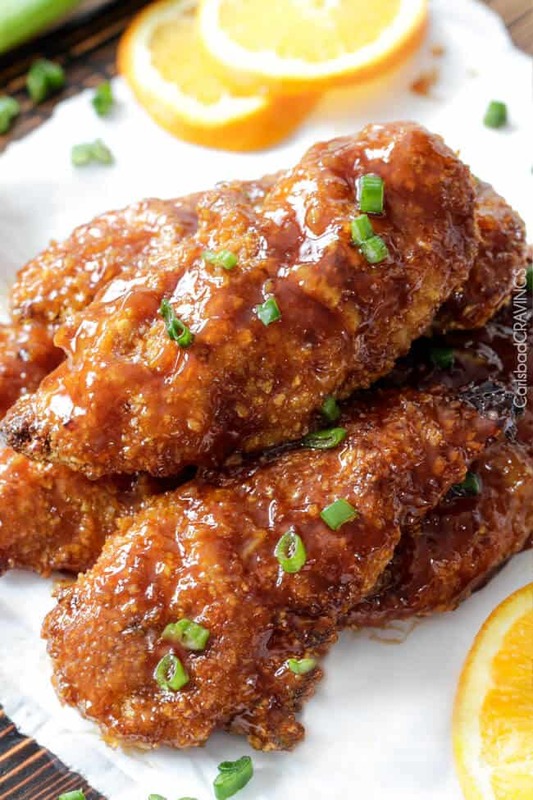 Sweet and Spicy Baked Orange Chicken Tenders are marinated and smothered in the most tantalizing sweet heat orange sauce you can’t even imagine! You will crave this chicken over your favorite Chinese orange takeout! 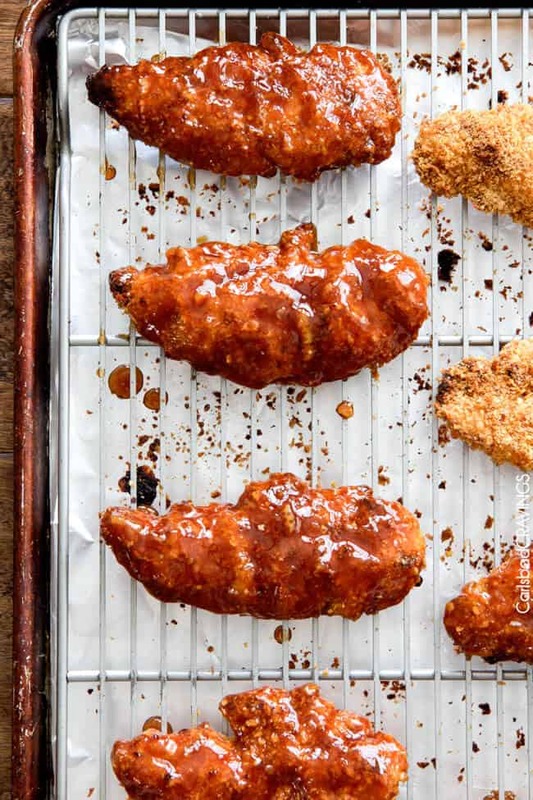 I’m already wanting more…More hypnotic Baked Orange Chicken Tenders. 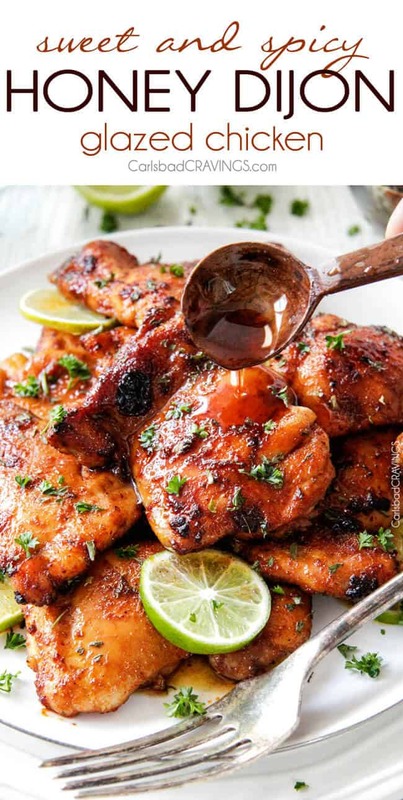 They are bursting with flavor by being marinated in a sweet and spicy (but not too spicy) orange sauce which doubles as the tantalizing sticky Orange Glaze later. 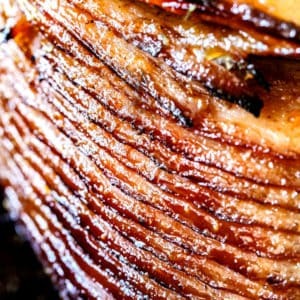 This is one of my favorite methods of cooking – to reserve some of the marinade, whisk it with cornstarch and it instantly becomes your glaze – double the flavor WITHOUT double work! 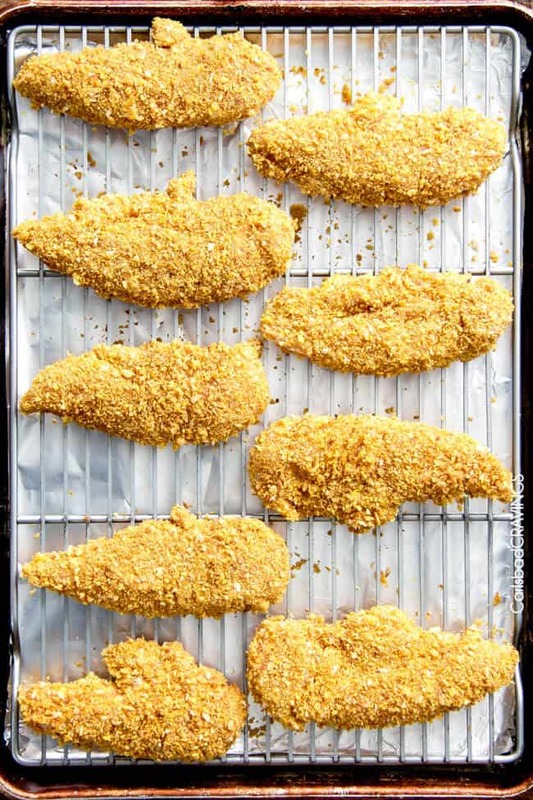 You then bake your chicken tenders for about 20 minutes while you heat your Orange Glaze. 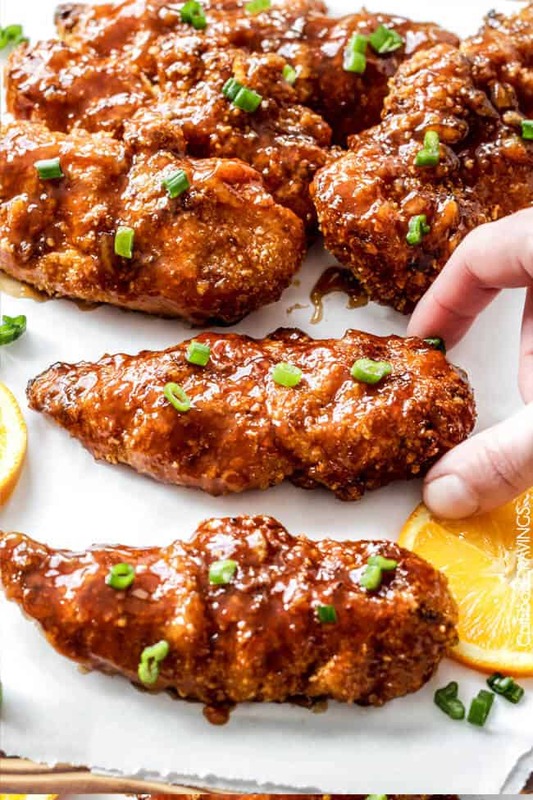 The to-live-for Orange Glaze is a harmonious concoction of orange juice, orange marmalade, brown sugar, and splashes of lemon juice, sriracha, hoisin sauce (like Asian BBQ sauce), ginger, garlic, etc. Are you drooling yet? I am. This ingredient list might seem a bit lengthy but keep in mind, you are simply whisking the ingredients together to create this tantalizing Glaze. After the Glaze simmers and thickens for just a minute or so, you bathe each chicken tender in the sticky sweet heat. 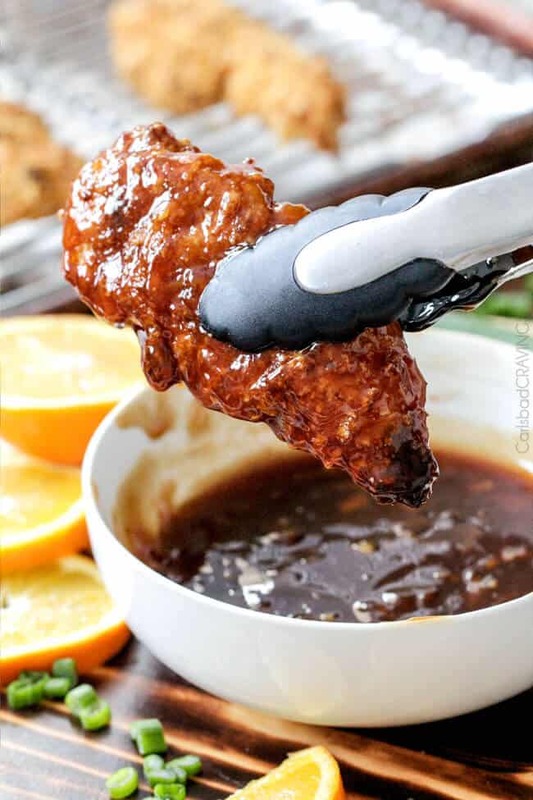 You can use tongs as shown, but honestly, I just use my fingers – because then I can lick my fingers when I’m done. Somehow cooking is just more fun that way…and more delicious. 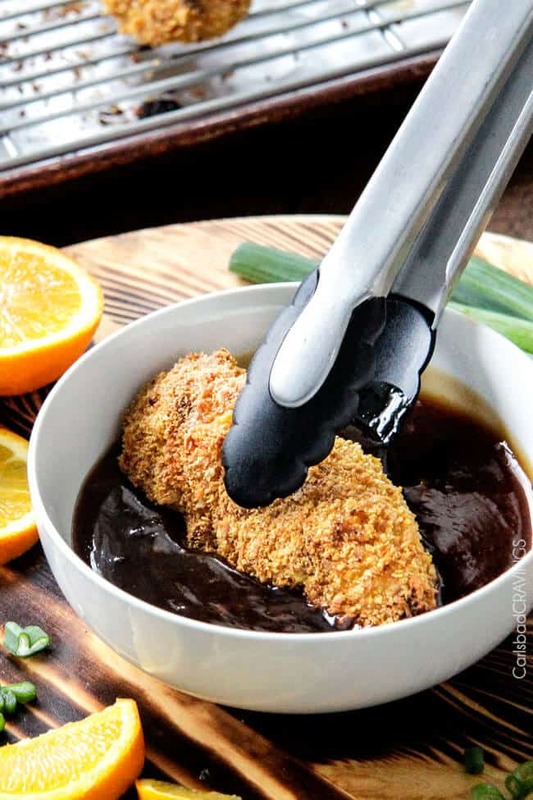 After you coat your chicken in sauce you are going to want to eat them right away – I mean of course you are going to want to eat them right away, but the sooner you devour them, the firmer the breading will be. That being said, they are still incredible with softer breading. As in Patrick ate all the leftovers and if you knew Patrick, he doesn’t do leftovers unless they taste just as AH-mazing the next day. These are amazing any day. 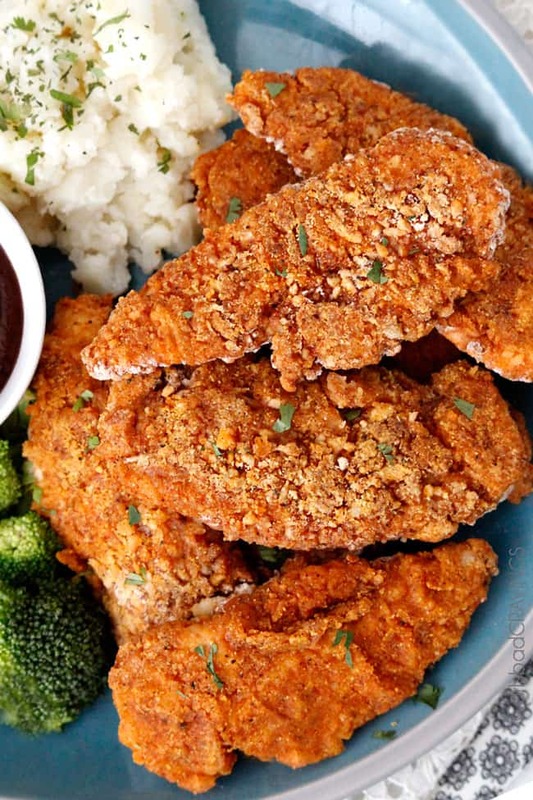 Want to try these Baked Orange Chicken Tenders? 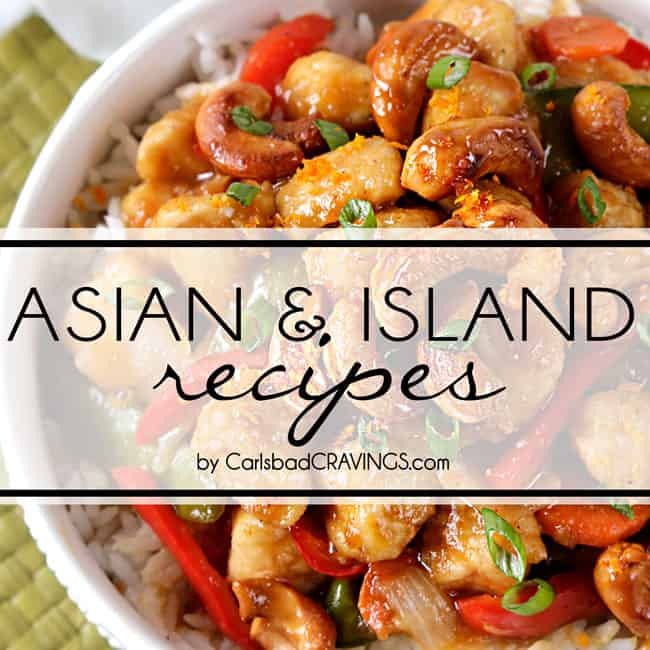 Pin them to your ASIAN, CHICKEN OR DINNER Board to SAVE for later! 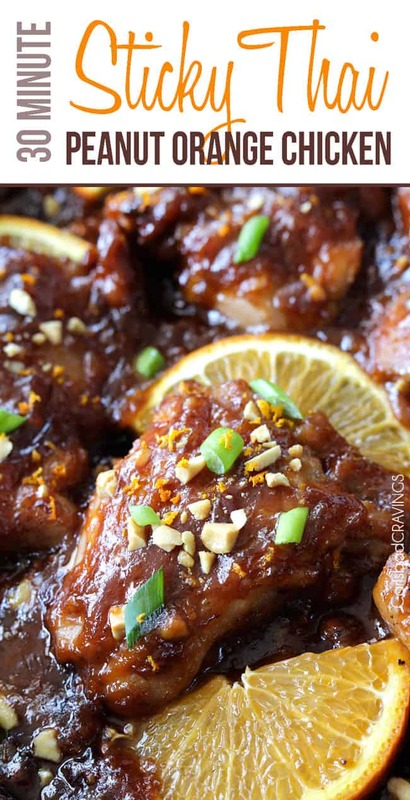 Whisk the Orange Marinade/Glaze ingredients together in a medium bowl. Add 1/3 cup to a large freezer bag with 1 tablespoon olive oil. Add the chicken and marinate 60 minutes up to overnight in the refrigerator. Refrigerate reserved Glaze separately. Preheat oven to 425 degrees F. Line a baking sheet with foil then top with a wire baking rack. Spray rack with nonstick cooking spray. Set aside. Line up your breading station: Add flour to a large freezer bag. Whisk milk and eggs together in a bowl or shallow dish. Mix panko, ground cornflakes, 1/2 teaspoon salt, 1/8 teaspoon pepper and 1/2 teaspoon garlic powder in a large bowl. Remove chicken from marinade and pat dry with paper towels. Add chicken to flour and toss until evenly coated. Working with one chicken tender at a time, remove from flour, shake off any excess then coat in milk/egg mixture and drain off any excess. 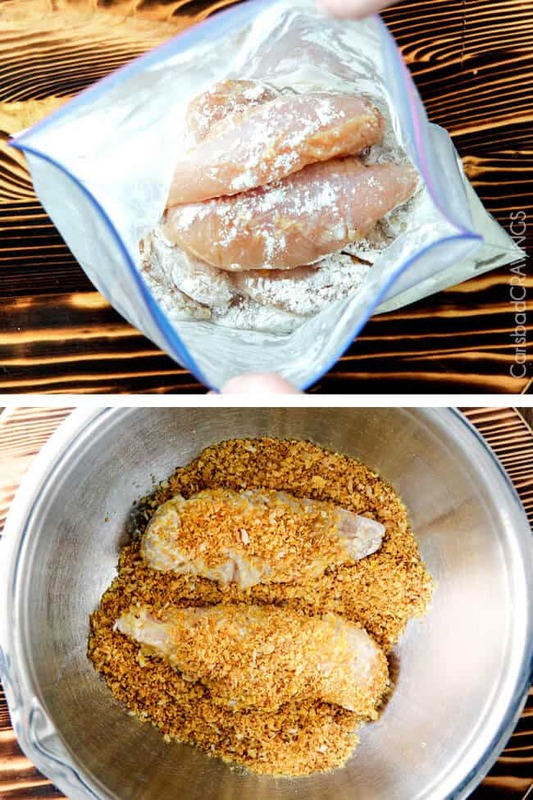 Roll chicken in panko/cornflakes, pressing to adhere. Shake off any excess and place on wire rack. Repeat until all chicken tenders are breaded. Bake for 20 minutes at 425 F degrees or until chicken is cooked through. Broil until golden. Let cool for 10 minutes while you prepare your Glaze. Add reserved Glaze to a medium saucepan and bring to a boil while stirring. Reduce to a simmer until slightly thickened, stirring occasionally. Remove from heat. Using tongs, dip chicken in Glaze to coat then return to baking rack or individual plates. Garnish with orange and green onions if desired. Total cooking time does not include marinating as that will vary upon individual. *You measure out 3 cups cornflakes before you grind them I use my food processor and pulse until the size of panko crumbs. You can place cornflakes in a freezer bag and crush with a rolling pin. You can substitute cornflakes with additional panko for a total of 1 1/4 cups panko and brown panko with 1 tablespoon butter. 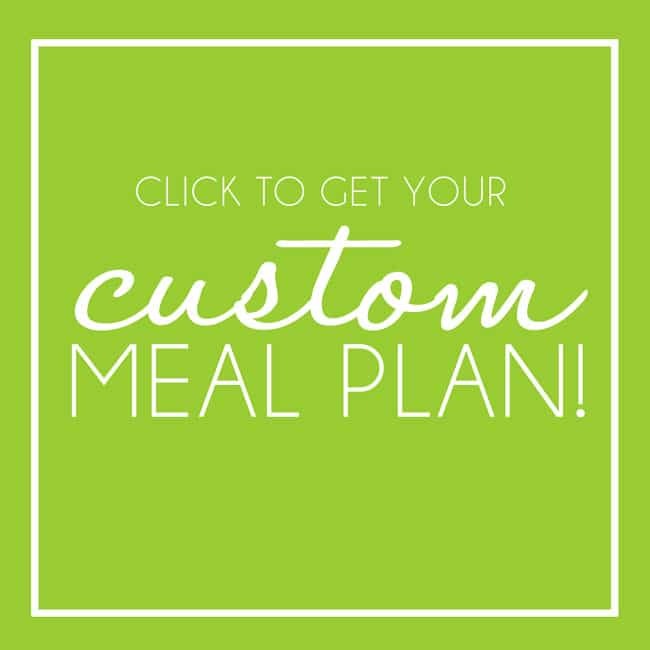 **You can do this while your chicken marinates and store in an airtight container until ready to use. ***The less time you wait between coating the chicken in the glaze and eating, the crispier it will be. That being said, the chicken has a wonderful texture but is not overly crispy. 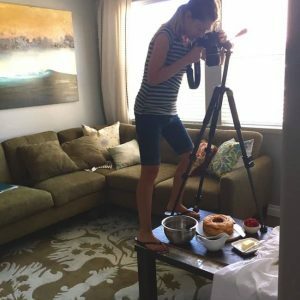 Breakfast is looking pretty darn boring after reading this post! 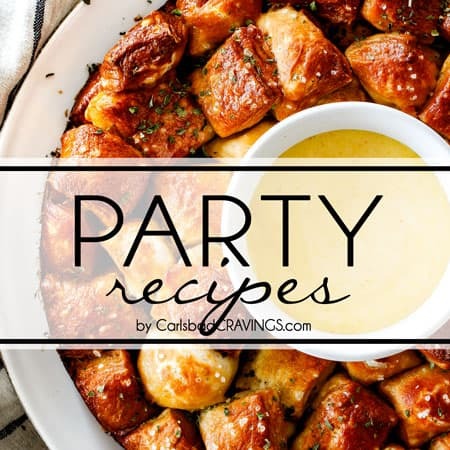 My oh my all of the recipes look amazing and we do eat chicken quite a few times a week. We definitely have panko on hand all the time — I’ll have to get a small box of cornflakes to complete the recipe. BTW — we eat so much chicken I swear I’m sprouting pin feathers 🙂 Have a great day!! LOL! I think I am sprouting feathers too! I love having chicken on hand – we eat it everyday so I am constantly trying to think of new ways to reinvent it so its not boring 🙂 Hope you can try it soon, thanks Marisa! You are too nice, thank you Dorothy! 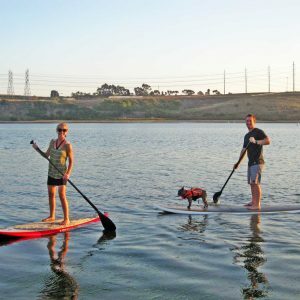 I try and be as upfront as I can 🙂 I am so excited for your son to try this – I think he will love it!! Have a fabulous weekend! Big fan here in SLC! Wow. 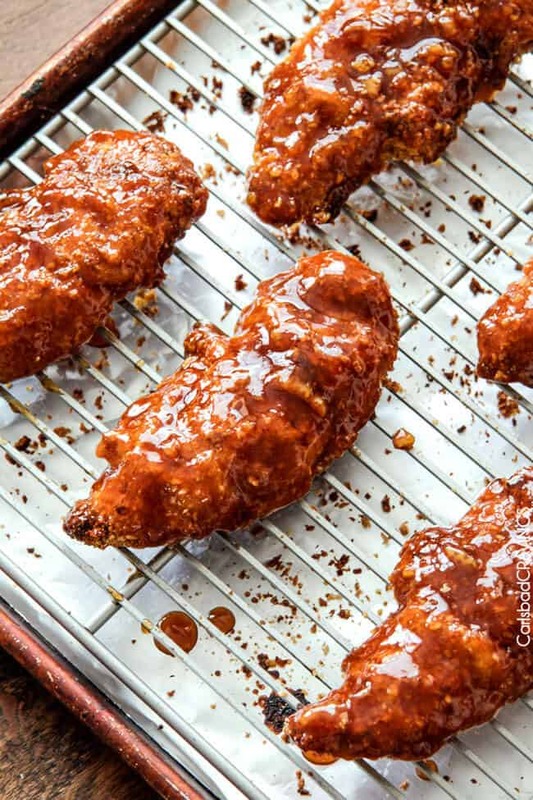 I could live off baked sweet and spicy chicken too. In fact, I think I already do. 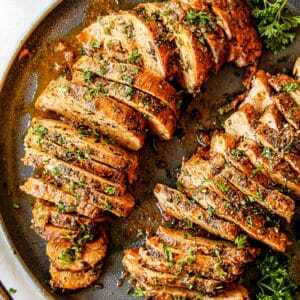 This chicken recipe is gorgeous. Can’t wait to have it for dinner. Sweet and Sour Chicken is a great choice to live off of! I hope you love this version too! Thanks so much! Thanks Tally! I hope you love it as much as your moms! Hey lovely lady! Am so darn far behind in my emails, had to just delete a bunch, except for the truly exceptional, that is!! Lol!! Had the typical,bad things occurring in 3’s.! !All of which had me in bed and useless for a few days. I DID make your pork,and was fantastic, made some pasta the same week that was also yours. A flank steak is waiting to be grilled for your carne asada recipe that we have been craving for, like a LONG time. All love California burritos,so am making the whole Jen recipe stuffs!! All the new recipes look awesome, am drooling, literally. Doc is trying to get some weight on me, bring on the beef I say!!! Hugs and hope all is happy, healthy and all good in your life sweetie!! P. S. Am sunscreen to about 400 +blogs, mostly food! Am a food spaz!!! Wow these look finger licking good!! My family would devour these!! You are so nice, thank you! I love taking the photos but it can be hard when all I want to do is eat the food 🙂 Hope you love this recipe! LOL! love that these were finger licking good Therese and I’m thrilled they will be a repeat! 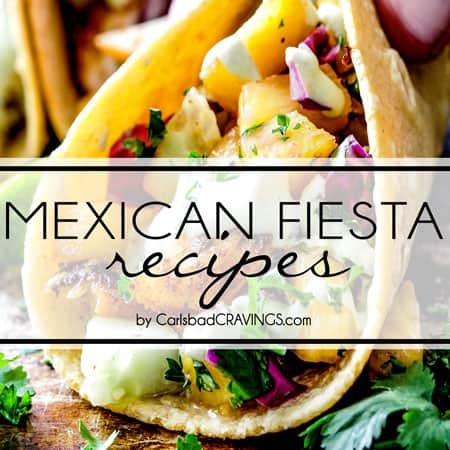 Thank you for trying my recipes and commenting – I love that you have found several your whole family enjoys! Have a great weekend! 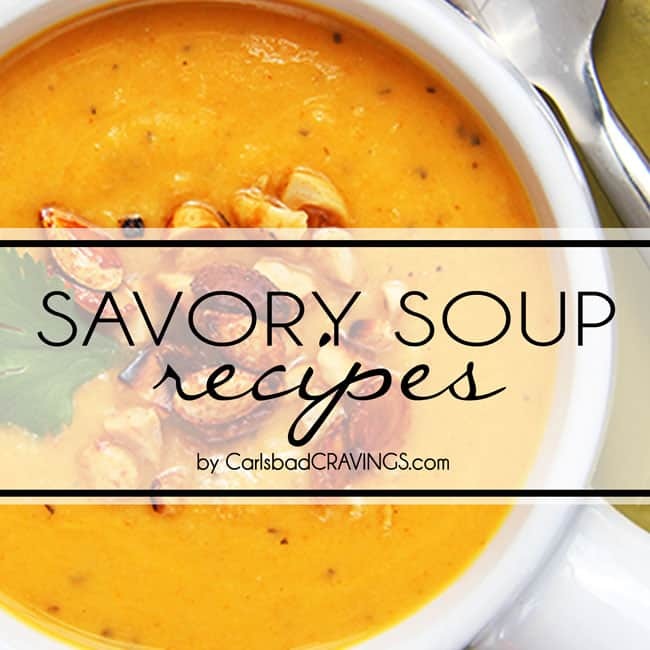 Excellent, fantastic recipe! I had to use 22 chicken tenders but all were satisfied! That is a lot of chicken tenders but I am so happy you loved the recipe! Thank you so much Sue! This time I made 28 so everyone had 4 each! Much better! Except my husband and I still seem to have only gotten 2! Hmm?! Also, I use the glaze as a dipping sauce or pouring over sauce due to time constraints. I also use all panko crumbs, I never have the cornflakes. Yum! Awesome Sue!….except for you and your husband only getting 2 part…someones sneaky 🙂 Love the idea of using the sauce as a dipping sauce – yum! Thank you! I love hearing your family is loving this one! Wow this orange chicken was amazing! My husband and I both loved it. Lot of prep work but totally worth it. I don’t have a wire rack so I heat up my cookie sheet in the oven prior to putting the chicken on it that way the coating crisps up right away and it doesn’t stick. The sauce was great. I had exactly 1/3 cup of orange marmalade; it’s like it was just begging to be used in this recipe 🙂 Will make again and again. I am so happy this was such a hit, worth the prep work and a new favorite – yay! Thank you so much! I love the tip of heating the cookie sheet prior to putting the chicken on it – I definitely will use that in the future! Thanks for taking the time to comment! I hope you find more favorites here! 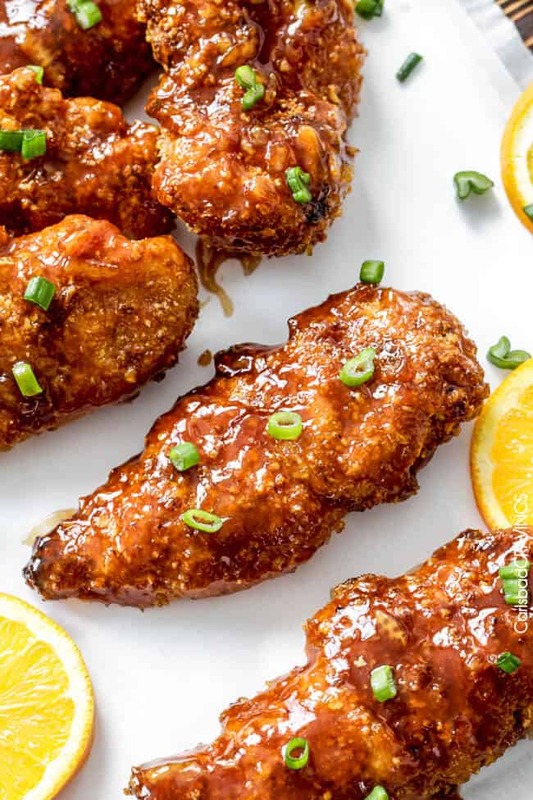 Your Sweet & Spicy Orange Chicken Tenders called for “NOT sweet orange marmalade.” What is unsweetened marmalade, and can you suggest a brand and/or where it can be found? Thanks. This looks delicious and can’t wait to make it. Hi Fran! Orange Marmalade comes not sweetened so if the label says “Orange Marmalade” – that is what you want as opposed to those that call out “Sweet Orange Marmalade” on the label – sorry for the confusion! From my experience it can be found anywhere from Wal-mart to Ralphs. Smuckers has a great one. Enjoy! 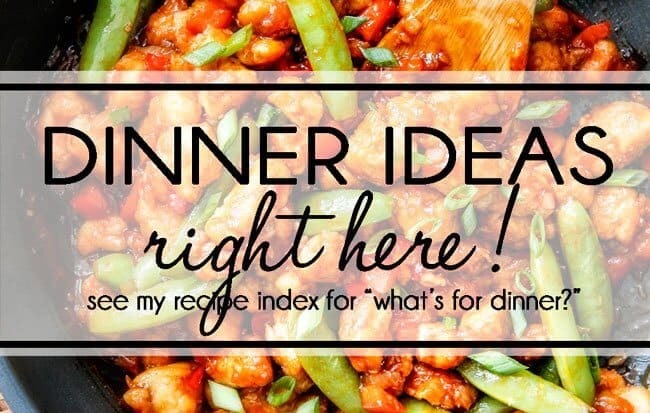 Made this for dinner last night and, holy smokes, it was DELICIOUS!!! Orange Chicken is our favorite Chinese takeout and this sauce was far better than we have found at any of the restaurants in our area. I made it as two individual chicken breasts instead of tenders because it’s what I had (and I was too lazy to cut them into fingers 😉 Kicking myself for not doubling it so we’d have leftovers for tonight. Thank you for such a fabulous recipe! YAY! I am thrilled you loved this so much Melanie! I actually just made this sauce into Chinese Orange Chicken last week and will be sharing the recipe soon – hope you love it just as much! I really want to try these, but I have hypertension so sodium and fat are on my radar. I was curious if you had a basic idea of the nutritional information in these? Hi Travis, I don’t calculate nutrition info but you can do that here: http://www.myfitnesspal.com/recipe/calculator Hope that helps! I’m fairly new to your website- finding you over Pintrest a few months ago, but I am now a dedicated fan!!! My family of 5 (15 month old, 5 year old, 7 year old included) love your recipes and I am never worried about spending time prepping a meal that no one likes– which is the worst! 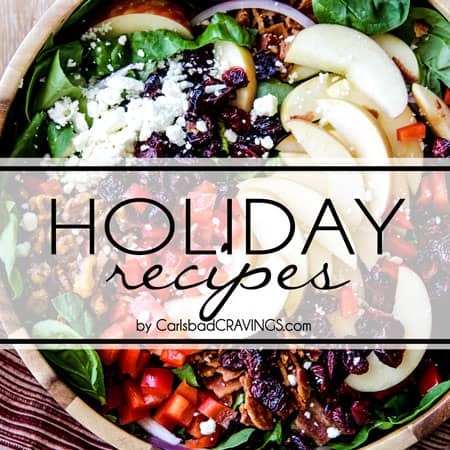 Sweet chipotle pork, honey cashew chicken, pulled BBQ chicken, the amazing dishes with peanut sauce which always make the kids happy, all the grilled kabobs that make the husband happy…. delish. I would love to know what sides you serve with your main dishes! Always seems like I am stir-frying some vegetables and serving rice with the Asian inspired cuisine and wondering about options to change it up. 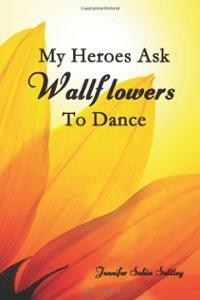 Hi Jennifer, sorry for the delay as I am way behind after recovering from pneumonia, but I so appreciate your comment! 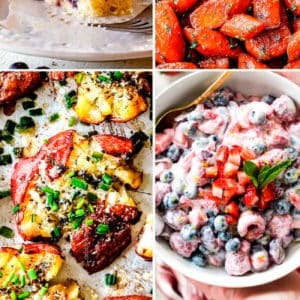 I am so happy you stumbled across my blog on pinterest and am honored to call you a “fan!” I am amazed you have already made so many of my recipes and I am thrilled everyone, including the kids are enjoying them! As far as sides go, I usually keep them pretty simple as my main dishes are a little more involved/flavorful and the star of the show. I do a lot of simple stir fried veggies like you as well as lots of roasted veggies. I have a few of my favorite roasted veggies under my SIDE section on my Recipe Index. 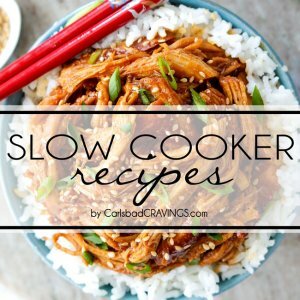 I also am a huge rice fan so I’ll often add rice with a variety of everything from beans to corn to tomatoes to my rice cooker for a side. hope that helps! Any chance you can make the sauce without orange juice? I have everything else, just no OJ. Will it still turn out the same? Hi Ashley, I would have to experiment to get good results as OJ is a predominant ingredient – sorry!